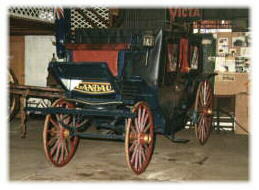 Harold Lamb began collecting and recreating horse drawn buggies more than 44 years ago at his Ower Street Museum. His hobby grew from a love of horses and old carriages. As one of Camperdown's best known characters, Harold Lamb has dedicated his life to bringing joy and happiness to the community. Born in 1916, the son of a soldier settler, Harold Lamb worked with horses on the family farm at Tesbury and became a third generation wheelwrighter and blacksmith. 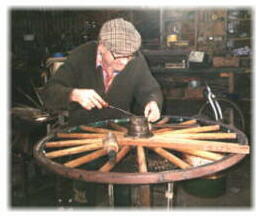 He was taught by his father Harry who originally learnt the trade from his father. His collection of 25 vehicles includes a French caleche, British landau, Victorian phaeton, horse drawn hearse, a jump seat buggy, delivery carts and hawkers wagons. An old "bone shaker" bicycle is also on display in his museum. 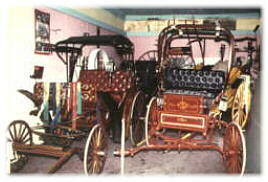 Many of the buggies originally operated in the Camperdown district. The display has been recognized by the Museums Advisory Board. 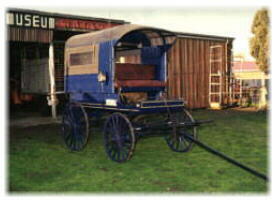 The vehicles are used not only for display purposes but also for local events and functions. Christmas in Camperdown would not be the same without Mr. Lamb making an annual pilgrimage through the streets with Santa Clause in the buggy, spreading good will to all they meet. He is also a regular participant at local agricultural shows and street parades. Mr Lamb has also been involved in other local activities including the chamber of commerce, tourism groups, Sun Tour cycling events, basketball association and junior football groups. He was one of Victoria's oldest trotting trainers and drivers, forced to retire in 1981 when he reached the maximum age of 65. It was in recognition of his dedication and enthusiasm in working for the community that Harold Lamb was awarded a British Empire Medal in 1972.